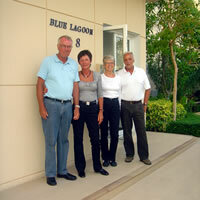 “Just returned from a wonderful holiday at the Blue Lagoon Resort Hua Hin. We stayed in a smart/clean 4 bedroom villa with ample space for our party of 8 people. Although the lagoon pool in the villa garden was not in operation, the facilities at the Sheraton hotel, just a short walk away were fantastic. The Sheraton has a huge pool with lots of interesting and pretty areas to swim around, together with a great infinity pool looking out to sea. The hotel also has ample sun-beds and garden area for sunbathing, and although a party of 8 we never had any problems finding beds together. We discovered a really nice bar just a short walk along the beach for our lunchtime Singha and found getting into Hua Hin at night, really easy – just ask your tuk-tuk driver to come back the next day. In town at night we discovered lots of good bars & restaurants with dishes to meet all requirements- the fresh fish was especially good! For the golf enthusiasts the local golf course, Palm Hills, was in great condition and well worth a visit. 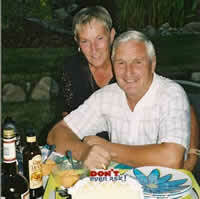 “Michael and Took, we would like to thank you for helping us have such a great holiday at the Blue Lagoon. It was super…suited our life style and made it one of the best holidays we”ve had! We loved the Condo Units, nice and quiet, close to the beach and of course the Sheraton. Everyone was so nice and friendly, the security people, the cleaning girls and the gardeners, but of course the best pair were you and Took. Thank you so much again for taking such great care of us, we will be in touch with you later about prices and availability for next year.” Best wishes to you both…. 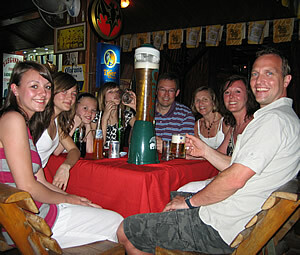 “The Blue Lagoon Resort is the right place for our family. Big apartment, fully fitted out, and with full access to the Sheraton and all its amenities – their pool is really the 8th Wonder of the World. We think the beach at Blue Lagoon is perfect for young kids, with the sandbar for them to explore. Also we would highly recommend the restaurant at the hotel next door, which serves fantastic wood oven pizzas. The apartment itself is nicely done, comfortable and modern – and big enough for our big family – a large bedroom for the boys and a lovely room for mom and dad. And I should mention the massive TV, which the boys loved! The location is perfect, close to Hua Hin but on the right side of town that it saves time on the trip to Bangkok. This is our second visit and we look forward to coming back again soon”.